In commemoration of David Ortiz’s final MLB season Big Time Bats is proud to offer this very special, full size Retirement Translucent Bat. 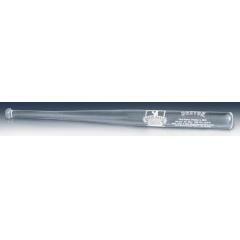 This beautiful 34 inch Translucent Bat is one of a kind and made with exclusive and cutting-edge technology. Each bat features the Red Sox logo and all final regular season career stats for David. To help avoid smudges and fingerprints each bat comes with a special pair of white gloves for handling. Ortiz had tremendous "farewell season," helping guide the Red Sox to the American League playoffs. He will retire as one of the most popular players in Red Sox history. "Big Papi" is a 3x World Series Champion with Boston, the 2013 World Series MVP, 6x Silver Slugger award winner, and the 2006 AL HR leader. This very limited unique bat honors a Red Sox legend and is sure to sell fast. Order yours before this VERY LIMITED series is sold out! Due to the very limited release of this item we must charge your credit card for the full amount immediately upon receiving your order. This policy ensures we reserve a bat for you. We will confirm your order by Email. This bat is not game used and may shatter like glass if dropped.